The NHS devastated without so much as a by-your-leave; Gen Y hung out to dry; legal aid cut for the vulnerable; social housing on the brink of collapse . . .
Margaret Thatcher sold off the nationalised industries, her political heirs are intent on leaving an even more radical legacy - selling off the state itself. Written with their trademark precision and passion, Toynbee and Walker reveal how in four short years a party that failed to win a Commons majority has been devastatingly effective. 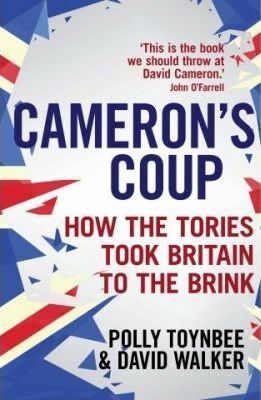 Blending polls and statistics with moving human stories from Taunton to Teesside, Sydenham to Sheffield, Cameron's Coup shows the alarming reversal in decades of social progress. As Toynbee and Walker argue, it has been nothing short of a revolution. And they ask the pressing question: are these changes irrevocable? This is essential reading for anyone who cares about their country.